Brig Gen Dwight E Aultman from the command of Camp Knox Ky. to command 10th infantry brigade at Fort Benjamin Harrison Ind. Was Chief of Artillery, Fifth Army Corps, in Meuse-Argonne Offensive. Fought in Spanish War and Served Also in Philippines — Senior Brigadier at Death. WASHINGTON, Dec. 12. - Brig. 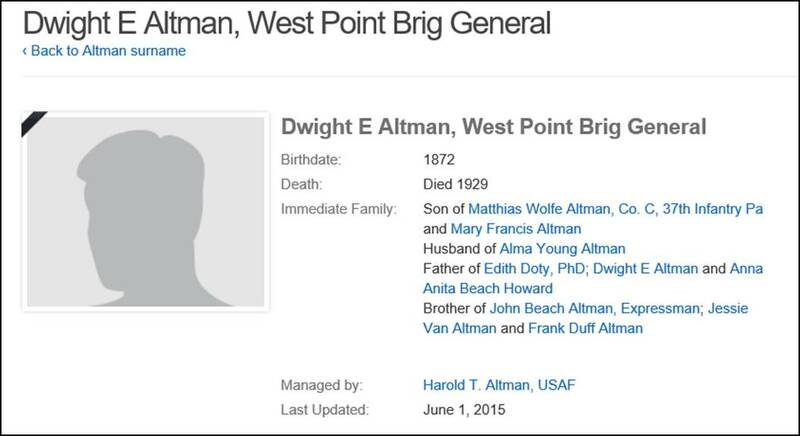 Gen. Dwight E. Aultman, senior Brigadier in the regular army and an artillery officer with a distinguished record in the World War, having served as Chief of Artillery of the Fifth Army Corps, died here today at the age of 57 in Walter Reed General Hospital. He was born in Allegheny, Pa., on Feb. 2, 1872, and was graduated from West Point in 1894. During the Spanish-American War he served with the Second Field Artillery in the campaign against Santiago de Cuba, including the battle of San Juan Hill and the siege of the city. Later he organized the artillery of the newly formed Cuban Army, and in 1906 again went to Cuba, this time with the army of pacification. Service in the Philippines followed a few years later. After the World War began, he was sent to Germany as an observer, remaining until April, 1915. Shortly after the United States entered the war he accompanied A. J. Balfour, now Earl Balfour, on the latter’s return to England from his mission to the United States. General Aultman next, as a Colonel, commanded the Nineteenth Field Artillery at Fort Sam Houston. He was transferred to the Fifth Field Artillery of the First Division in the Autumn of 1917, joining that regiment in France in October. He commanded it on the Luneville front in October and November, 1917; on the Toul front from January to April, 1918, and on the Montdidier front in April, 1918. In October, 1917, General Aultman was appointed chief of the Fifth Army Corps, in which capacity he participated in final operations of the Meuse-Argonne offensive. After the armistice he served as chief of artillery of the Second Army until the Summer of 1919. He was on duty with the War Department general staff until April, 1921, when he was appointed a permanent Brigadier General of the regular army. 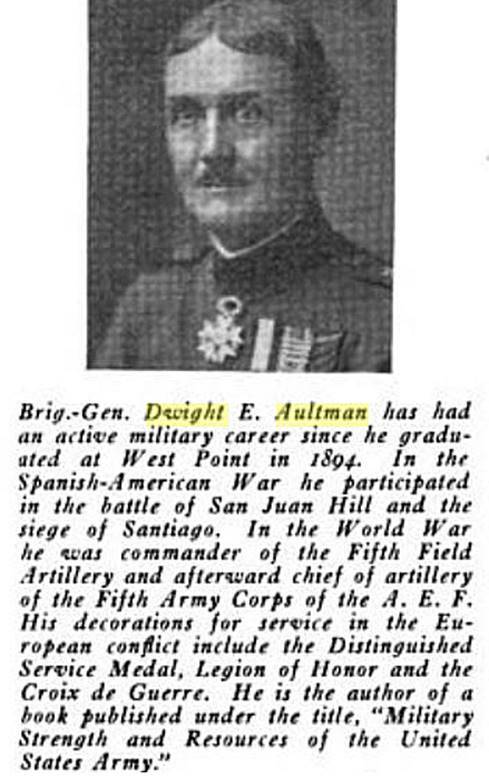 The following excerpt comes from a November 20, 1924, Lowell Tribune article (page 1, column 5) entitled "Lowell Boys Honored at Indiana": General Dwight E. Aultman pinned pledge ribbons of Scabbard and Sword, honorary college military fraternity on nine officers of the Indiana University R.O.T.C. during the Armistice day celebration at the school. There were nine officers out of twenty-two [who] received the honors, among them being Lieutenant Elliott Belshaw. Pittsburgh Dispatch 9 May 1890 p. 2, col 5 "Appointed to West Point A letter has been received from Hon. John Dlazell by Dwight E. Altman, of Duquense Heights, informaing him of his appointment as a cadet to West Point. he graduated at the High School last year with high honors."